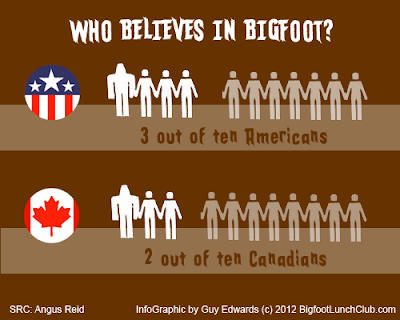 and one-in-five Canadians (21%) think Bigfoot is “definitely” or “probably” real. subdividing the research by gender. People in the United States are more likely than Canadians to consider that Bigfoot is real, a new Angus Reid Public Opinion poll has found. In the online survey of representative national samples, three-in-ten Americans (29%) and one-in-five Canadians (21%) think Bigfoot is “definitely” or “probably” real. The Bigfoot phenomenon is definitely bigger in the United States, where 77 per cent of respondents claim to have heard “a great deal” or a “moderate amount” about Bigfoot (compared to 61% of Canadians). 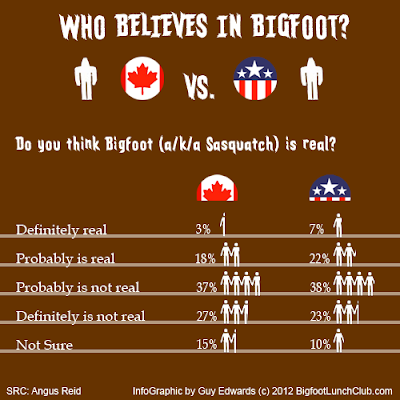 In Canada, Albertans (29%) are more likely to think that Bigfoot is real than Quebecers (19%), British Columbians (18%) and Ontarians (17%). In the United States, respondents in the West (32%) are more likely to believe that Bigfoot is real. People in Britain were asked similar questions about another long-standing myth: the Loch Ness Monster. Overall, 78 per cent of respondents say they have heard “a great deal” or a “moderate amount” about the Loch Ness Monster. Only 17 per cent of Britons believe the Loch Ness Monster is “definitely” or “probably” real, a proportion that jumps to 24 per cent in Scotland. While American and Canadian men are more likely to believe that Bigfoot is real than their female counterparts, women in Britain are more likely to think that the Loch Ness Monster is real than British men. 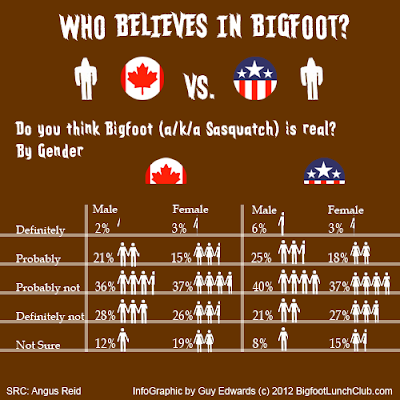 Liberal Party voters in Canada (16%) are the least likely to believe that Bigfoot is real. Democrats in the United States more likely to believe in Bigfoot (33%) than Republicans or Independents. In Britain, almost a third of Scottish National Party (SNP) voters believe the Loch Ness Monster is real, while Liberal Democrats (15%) are the least likely to agree with that assessment. Methodology: From February 15 to February 29, 2012, Angus Reid Public Opinion conducted an online survey among 1,007 Canadian adults who are Angus Reid Forum panellists, 1,016 American adults who are Springboard America panellists, and 2,011 British adults who are Springboard UK panellists. The margin of error—which measures sampling variability—is +/- 3.1% for Canada and the United States, and 2.2% for Great Britain. The results have been statistically weighted according to the most current education, age, gender and region Census data to ensure samples representative of the entire adult population of Canada, the US and Great Britain. Discrepancies in or between totals are due to rounding. To be fair, there is a significant difference only among men. I find that interesting.